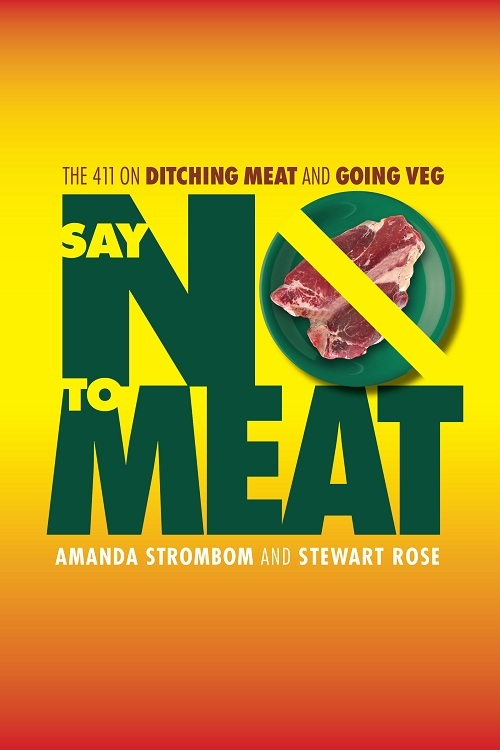 To get started at a beginner level, you’ll find our book Say No to Meat! The 411 on Ditching Meat and Going Veg, to be invaluable. It’s a comprehensive guide to the whys and hows of becoming vegetarian, written in an easy-to-digest question and answer format. It also contains shopping tips and basic information about ingredients, along with some great tasting and easy-to-follow recipes. To try some delicious vegetarian food, and meet lots of interesting people, come to one of our Monthly Dining Events, a great way for beginners to dip their toes. To learn about the many health and other benefits of vegetarian food, and to learn how to cook some foods which may be new to you, such as tofu, tempeh and quinoa, come to one of our free classes. To discover lots of new foods to buy, to learn from doctors and chefs, and to gain the confidence that you can be a vegetarian, come to Vegfest, our annual vegetarian food festival, held in the Spring each year. To learn to cook, buy The Veg-Feasting Cookbook, which is packed with a wide variety of recipes from many different cuisines, to give you lots of ideas and support. To learn more about how to shop for healthy food, including how to select produce, read ingredient labels, and so much more, buy our new shopping guide In Pursuit of Great Food. For many more recipes and lots of helpful advice, join Vegetarians of Washington and receive a free cookbook. You’ll also receive our free emailed newsletter, The Vegetarian Page. www.vegetariantimes.com – Vegetarian Times has a huge resource of recipes where you can specify to search for vegetarian, vegan, gluten-free etc. www.nutritionmd.org – Nutrition MD is a valuable resource for dietary advice, meal plans and a huge database of healthy vegan recipes. All major grocery stores these days offer all the basics needed for a healthy vegetarian diet – fresh and frozen fruits and vegetables, whole grains, legumes (both dried and canned), nuts and seeds. Many also offer complete vegetarian frozen meals, and specific products such as non-dairy milks, yogurts and cheeses; meat alternatives such as tofu, tempeh, seitan, and meat analogues (veggie burgers, veggie chicken nuggets etc); plus specialist products such as nutritional yeast and egg replacer, which can be useful in replacing dairy and eggs in recipes. www.wholefoodsmarket.com – Whole Foods Markets – 9 stores from Bellingham to Vancouver WA. www.wafarmersmarkets.com – for fresh produce from a Farmers’ Market near you. www.naturalchoice.net – Natural Choice directory, for other natural health and wellness resources. www.americanvegan.org – American Vegan society – The American Vegan Society is a nonprofit educational membership organization teaching a compassionate way of living that includes veganism. They produce a quarterly magazine, The American Vegan, which discusses the philosophy of compassionate living, and the practical aspects of the vegan lifestyle. www.ivu.org – International Vegetarian Union – Hundreds of Vegetarian groups and societies are affiliated to the International Vegetarian Union. This site lists them all, and provides in depth articles on every aspect of vegetarian lifestyles from around the world. www.vrg.org – Vegetarian Resource Group – This group has a fantastic range of information on vegetarian and vegan recipes, vegetarian and vegan nutrition information, vegetarian and vegan cookbooks, Vegetarian Journal excerpts, vegetarian travel information, vegetarian and vegan brochures, and even a Vegetarian Game. Enjoy! www.veggiedate.com – Vegetarian Dating Site – If you’re looking for a vegetarian date or a roommate, this is the largest and most popular vegetarian and vegan dating service. One couple who met through VeggieDate, held their first date at a Vegetarians of Washington Monthly Dining Event, and a year later, they were married!